copyranter: Hey UPS? Your Indonesian ad agency stole an idea. "Operate your own Glide-O-Bike airport"
China Ad Watch: World Wildlife Fund. The tension in this Arrow shirt ad is palpable. Have you hugged HIV bear today? (click images) (L) To promote United Parcel Service's express delivery, ad agency Ogilvy & Mather Jakarta says they built and placed these "striking" installations in high pedestrian traffic areas around the city. Pretty cool looking. 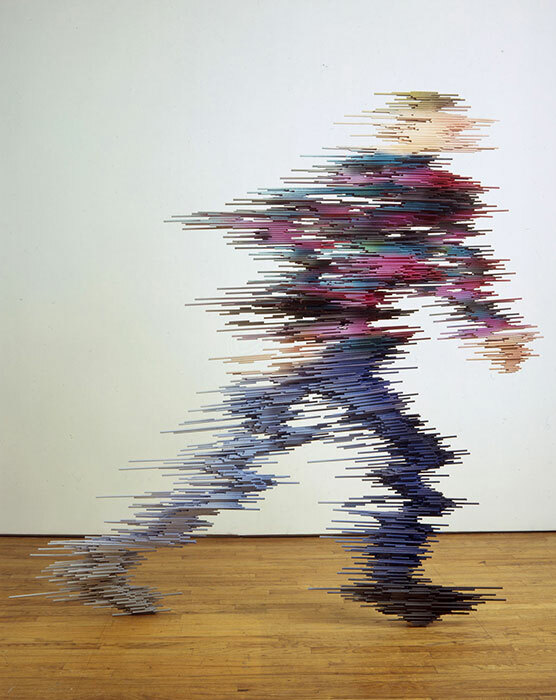 (R) "Pedestrian" (wood and paint, 2007) by Brooklyn-based sculptor Ryan Johnson (found here, scroll down). Jury of me says: guilty. Thanks to an anon AOTW commenter for the tip. Ad agencies don't just steal from artists. They also usurp copyrighted pop culture images. And use celebrities without permission. And of course, they steal from each other all the time. Check it out, for comments from UPS and Ogilvy. We've also heard from Johnson and will be seeking comment from him as well. I didn't see your post. I got my info from Ads Of The World, as noted. But thanks for the update. It might have been coincidental, except they even copied the small "kickstand" feature!! Interestingly, Ryan Johnson also attended the Jakarta International School (he was in the graduating class a few years ahead of me). I notice that he made reference to this connection in his statement to fastcodesign.com, as well.